THIS WILL NOT WORK WITH ANY INGREDIENTS ADDED BY OTHER MODS! Do with this mod whatever you like. It's not like it took a lot of effort to make. Hell, the whole process of uploading this to the Nexus has taken me about 10 times as long as these small edits did. Just like.. made the ingredients weightless, man. Makes all ingredients weightless. I made this for my own personal use, but figured someone else might be interested. There's a mod like this for OpenMW made by salvador242 which can be found here: Weightless Alchemy Ingredients for OpenMW﻿. It's probably better than mine, too. So if you have OpenMW definitely check it out. If he or she should decide to un-hide it, I am happy to remove this mod if asked to do so. 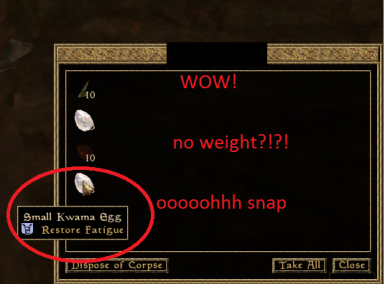 All I did was loading up the CS, ticking Morrowind.esm, Bloodmoon.esm and Tribunal.esm, then looking at the ingredients tab and changing the weight value of all to 0. It's nothing particularly creative or difficult.